Canaveral National Seashore (CANA)  is a United States National Seashore located in Brevard County and Volusia County in East Central Florida. Canaveral National Seashore is situated on a barrier island between New Smyrna Beach, Titusville, and Cape Canaveral, along Florida's Central East Coast. The park's 24 miles of shoreline is the longest stretch of undeveloped public beach on the east coast of Florida. Inviting park highlights include pristine, undeveloped beach, dunes and lagoon offering sanctuary to an abundant blend of plants and animals. Year-round recreation includes fishing, boating, canoeing, surfing, sunbathing, swimming, hiking, camping, nature and historical trails. The Canaveral National Seashore was created by an Act of Congress on January 3, 1975, to "preserve and protect the outstanding natural, scenic, scientific, ecologic, and historic values of certain lands, shorelines, and waters of the State of Florida and to provide for public outdoor recreation use and enjoyment of the same". Mosquito Lagoon, which comprises over two-thirds of the park, is designated an Outstanding Florida Water and as a part of the 155-mile long Indian River Lagoon (IRL), an Estuary of National Significance. The IRL is considered the most diverse and productive estuary in North America. Mosquito Lagoon supports nationally-recognized commercial and recreational fisheries for finfish, clams, oysters, blue crabs and shrimp. The park provides habitat for 14 federally-listed (Threatened and Endangered) animal species, ranking it second in the entire National Park Service. Three sea turtle species deposit approximately 4000-8000 nests on the beach each year. Large numbers of waterfowl and wading birds utilize the Seashore as a migratory stopover and wintering ground. Located along the "frost line", the park contains a rich and unique mixture of subtropical and temperate plants found nowhere except central Florida. 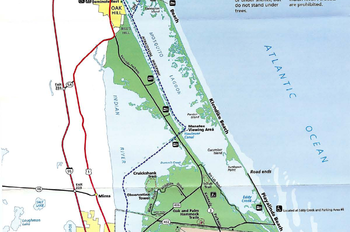 Much of Canaveral National Seashore is comprised of a barrier island ecosystem. A narrow island 24 miles in length separates the Atlantic Ocean from Mosquito Lagoon. On the east side of the island lies a sandy beach. The beach is backed by a single dune ridge, averaging 12 feet in height; however, in some areas, the dune has been obliterated by storm overwash. The backside of the dune is gradually sloping and anchored by a dense growth of vegetation. High marsh, mangrove and pockets of live oak/cabbage palmetto hammock occur along the shore of Mosquito Lagoon. Wider sections of the island show where former inlets existed. Mosquito Lagoon is about one mile wide and averages four feet deep. It is basically a dead end sack, connected to the ocean by Ponce de Leon Inlet, 10 miles north of the park and to the Indian River by the Haulover Canal, on the western side of the lagoon. As a consequence, there is little flushing and tides, primarily wind-driven, are measured in inches. 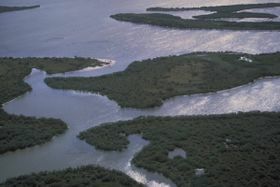 Several characteristics distinguish the northern third of the Mosquito Lagoon from the remainder of the lagoon. It contains numerous islands, consisting of hammock, mangrove and high marsh vegetation, while the southern two-thirds of the lagoon is open. Also many small, intertidal oyster reefs occur in the northern portion of the lagoon. This is partially due to the closer proximity to Ponce de Leon Inlet. Mainland portions of the park consist of pine flatwoods, liveoak/cabbage palm hammock and live oak scrub. A system of ridges and alternating swales can be seen in the south end of the park, revealing the location of former shorelines formed during prior geologic periods. The highest point in the park is actually man-made, a 35 feet high mound of oyster shells constructed by Native Americans between 800 and 1400 A.D. Called Turtle Mound, its summit offers a magnificent view of the lagoon, ocean and barrier island. Several other significant man-made alterations should be also mentioned. A channel 12 feet deep is maintained along the northwest side of Mosquito Lagoon for the Intercoastal Waterway, which then extends eastward through the Haulover Canal about halfway down the west side of Mosquito Lagoon and into the Indian River. Because it is deeper than the rest of the lagoon, it attracts fish that prefer deeper water and it may serve as a sink for muck and associated pollutants, such as heavy metals. An even greater impact on the lagoon has been alteration of marsh areas for mosquito control. This included digging an extensive system of ditches, beginning in the 1920's, and construction of miles of earthen dikes in the 1960's and 1970's to create impoundments. Many of these dikes are now being breached or completely removed to reconnect valuable marsh areas with the lagoon system. The term "forest", as most people think of it, does not really fit Canaveral National Seashore; however, there are conspicuous areas of big trees. These are called hammocks, which are basically islands of trees surrounded by marsh or scrub. At CANA's location along the "frost line", hammock overstory consists of temperate species, while the understory is primarily subtropical. Predominate overstory trees are live oak (Quercus virginiana) and cabbage palm (Sabal palmetto). Other common trees are southern red cedar (Juniperus silicicola), redbay (Persea borbonia), southern magnolia (Magnolia grandiflora), hackberry (Celtis laevigata) and pignut (Carya glabra). Typical understory trees and shrubs include nakedwood (Myrsianthes fragrans), marlberry (Ardesia escallanioides), white stopper (Eugenia axillaris) and yaupon holly (Ilex vomitoria). A keen observer can find several species of rare orchids, bromeliads and ferns growing on the limbs of the overstory trees, particularly large live oaks. Two other tree communities are common in the park - oak scrub and pine flatwoods. Oak scrub has much smaller trees than the hammocks, generally being 10 feet or less in height. It is comprised of several live oak species, including myrtle oak (Quercus myrtifolia), chapman's oak (Q. chapmanii), sand live oak (Q. geminata) and some live oak (Q. virginiana). These are called live oaks because they retain green leaves throughout the winter. Several federally-listed animals and species of concern, such as the Florida scrub jay, eastern indigo snake and gopher tortoise live in scrub oak habitat. Scrub oak is a fire adapted community; under natural conditions it will burn every 7-20 years. This keeps the oaks under six feet tall and maintains open areas. If fire is excluded, the trees grow to heights of 12-15 feet, open areas close in and the habitat is no longer suitable for the jay, snake or tortoise. The park is implementing a prescribed fire program to return fire to its vital role in the CANA ecosystem. Pine flatwoods contain large slash pine trees (Pinus elliottii), up to 30 meters high, in an open canopy. Main shrub species include saw palmetto (Serenoa repens), myrtle oak, fetter bush (Lyonia lucida), stagger bush (L. fruticosa), wax myrtle (Myrica cerifera), and gallberry (Ilex glabra). The pines are self-pruning, leaving a large gap between their branches and the shrub layer. The pine flatwoods are also fire adapted and if not burned periodically, will degrade as wildlife habitat. At CANA the bald eagles nest in the tallest pine trees. Biologists believe that the number of nesting eagles in the park is limited by the number of suitable nesting trees. Therefore, it is critical to allow fire to stimulate the regeneration of smaller pines and reduce high fuel loads that could kill nesting trees. Canaveral National Seashore (CANA) has a diverse and fascinating variety of aquatic and terrestrial animals. The park provides habitat for 14 species of federally-listed threatened or endangered animals, the second greatest number in the entire National Park Service. The park and adjacent Merritt Island National Wildlife Refuge are well known for great birding and are favored destinations for avid bird watchers. In addition to the the three species listed above, large numbers of migrating waterfowl, wading birds and shorebirds can be seen during the spring and fall migration periods and winter. CANA is equally renowned for outstanding fishing in the ocean surf and Mosquito Lagoon. The lagoon also harbors abundant populations of oysters, clams, blue crabs and shrimp. Summers are hot & humid with temperatures in the mid-to-upper 90's. Winters are mild with day-time temperatures in the 60-70 degree range. Short periods of cold weather dipping down to the freezing mark can be expected in January & February. Hurricane Season runs from June thru November, and is normally most active between August & October. Daytona Beach International Airport in Daytona Beach. Orlando International Airport in Orlando. Space Coast Regional in Titusville. 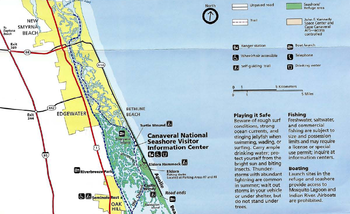 The national seashore and the wildlife refuge, located midway on Florida’s east coast between Daytona Beach and Melbourne, are accessible via U.S. 1, I-95, and Fla 528 (Beach Line Expressway). The northern access, Apollo Beach, is on Fla A1A at the southern-most end in New Smyrna Beach. Seminole Rest is located east of US-1 in Oak Hill on River Road. In Oakhill, turn east onto Halifax Avenue, which is located by the flashing caution light on US-1. Take Halifax Avenue east to River Road. Turn north on River Road. Seminole Rest is two tenths of a mile on the east side of River Road. The southern access, Playalinda Beach in Titusville, is on Fla 406/402. Playalinda Beach is reached via Fla 402 (also known as Beach Road). From I-95, the exit number for our north district (Apollo Beach) is 249B. For the south district (Playalinda), the exit number from I-95 is 220. At both exits, go toward the east & follow the signs. Daily Use Fee: $10.00 per person. 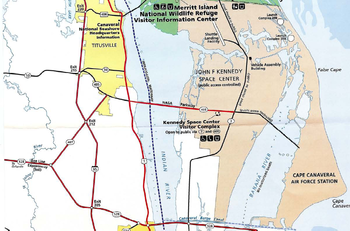 Annual Park Pass: $40.00 (valid at Canaveral National Seashore only). Individuals on foot or bicycle; $3.00 per day. You may leave the park and return the same day by presenting your valid entrance fee receipt. There is no public transportation in the park. The park visitor may tour the park via private vehicle, bicycle, or on foot. Horseback riding is available in the North District by reservation. A permit is required and the visitor must provide their own horse. Eldora State House, 7611 S. Atlantic Ave., New Smyrna Beach, (386) 428-3384. Sa,Su 12N-4PM. The Eldora State House is a Museum located within Canaveral National Seashore. Black Point Wildlife Drive. A six-mile self-guided scenic drive in the refuge winds through pine flatwoods and impounded marsh and provides excellent views of many species of wildlife. Turtle Mound. Located along Mosquito Lagoon in the north end of the park, this archeological site was built by Native Americans between 800 AD and 1400 AD, it consists of 1.5 million bushels (52.86 million liters) of oyster shells. At 35 feet above the surrounding landscape it yields a panoramic view that extends for miles. It is a favored spot to watch for migrating hawks and oceanic birds moving along the coast. The mound is also the northernmost known location for several species of subtropical plants. Seminole Rest, River Rd., Oak Hill (From Route 1 in Oak Hill, turn east at light on Halifax Avenue, then north on River Road to the entrance (about 1.5 miles from Route 1)). Open Saturday-Sunday, 12 -4. An ancient Native American Mound with a half-mile wheelchair accessible trail with wayside exhibits. The site has parking and rest room facilities. Seminole Rest consists of several prehistoric shell mounds dating from 2,000 BC to 1565 AD. Snyder's Mound, the largest mound at this site, is unique because few structures this large remain intact today. Two turn of the century buildings occupy the mounds and have aided in their preservation. Turtle Watch During June and July after hours when the seashore is closed to the general public. These programs give park visitors an opportunity to learn about sea turtles and the role that the National Park Service plays in their conservation as well as the possibility of watching turtles nest and lay eggs. Open to persons eight years of age and older. Programs are limited to thirty people per night and a maximum of six persons per reservation. Reservations for the 2016 Turtle Watch programs began in May 2016. $14.00 per person; senior pass holder $7.00; children 8 to 15, free. Canaveral National Seashore Visitor Information Center (North entrance), 7611 S. Atlantic Av., New Smyrna Beach, (386) 428-3384 ext 0. Park Headquarters Canaveral National Seashore (South entrance), 212 S. Washington Avenue, Titusville, FL 32796, (321) 267-1110. Pontoon Boat Tours, Reservations required: (386) 428-3384 ext. 10. National Park Rangers offer two-hour tours on the pontoon boat, Tortuga del Sol from the Visitor Center on most Fri., Sat., & Sun. weather permitting. $20.00 per person. Beaches, 321-867-0677. The seashore has undeveloped beaches and limited services. There are no designated picnic areas, phones, food, or drinking water. Lifeguards are on duty from May 30 to September 1st at both Playalinda and Apollo. These beaches have restrooms and boardwalk access. Visitors with disabilities will find beach access points at Playalinda Beach: Eddy Creek and Parking Area No. 8; and at Apollo Beach: Areas No. 1 and No. 5. First aid and drinking water are at information centers. Surfing is permitted in the park. Klondike Beach can only be reached by foot (a back country permit is required). Naturists park in the northernmost Playalinda lot, No. 13, and head northwards past a signpost to a clothing-optional beach area well away from the parking. It is not sanctioned by the park service, but posting this keeps beachgoers aware so they can plan accordingly. Seashore parking areas may be closed if lots are filled or if boardwalks are in the process of refurbishment. Hiking The seashore and refuge offer short self-guided trails. Castle Windy and Turtle Mound trails have shell middens left by Timucuan Indians. Turtle Mound Trail boasts a view of the ocean and Mosquito Lagoon. Eldora Hammock, Oak Hammock, and Palm Hammock trails wind through densely vegetated hammocks. In Merritt Island Wildlife Center Cruikshank Trail has an observation tower and marsh views. Hunting Seasonal hunting of migratory water fowl is allowed in the seashore and refuge and is part of the refuge’s waterfowl management. Display or use of firearms, other than for authorized hunting activities, is prohibited. Boating Launch sites in the refuge and seashore provide access to Mosquito Lagoon and Indian River. Airboats and PWC are prohibited. Canoe rentals, but not kayak rentals, are available for campers for campsites #1 through 5. If available canoes may be rented on a first come, first serve basis from 9:00am- 12N. Canoes must be returned to launch area no later than 2:00. Guided canoe trips most Wednesdays. Reservations required. Some experience needed. There is no charge. Fishing Freshwater, saltwater, and commercial fishing are subject to size and possession limits and may require a license or special use permit; inquire at information centers. Horseback riding Between the months of November and April horse use is allowed on designated sections of the Seashore. Permits are required as well as a valid Coggins test. Reservations may be obtained by calling 386-428-3384 ext. 0. The Information Center has an Eastern National Sales area offering books, t-shirts, bug spray and educational items pertaining to the seashore. There are no concessions in the seashore which sell food or sundries. A soft drink machine is available in the Apollo District at the Information Center. The Center also has an Eastern National Sales area where you may purchase books, tee shirts, bug spray and other educational items pertaining to the seashore. We encourage you to bring what you need with you. You may leave the park and return the same day by presenting your valid entrance fee receipt. Alcohol is permitted, but glass containers are prohibited on the beach. There are no motels or lodging in the park. Try New Smyrna Beach or Titusville. Camping is not allowed in the refuge. Private campgrounds are available in nearby communities. 14 boat accessible primitive campsites are available within CANA boundaries. Reservations necessary to obtain permit. $10/night up to 6; $20/night 7 people or more. Canoes available for rental for camping only $25.00/day. Rip currents and rough surf conditions may be encountered when swimming or surfing. The presence of stinging jelly fish on the beach is also common. Sunburn can occur even on cloudy days. Re-apply sunblock regularly. Carry ample drinking water with you & protect yourself from the bright sun and biting insects. Afternoon thunderstorms with frequent lightning occur often during the summer. Wait out storms in your vehicle or under shelter. East Central Florida has many other attractions. This page was last edited on 2 June 2017, at 15:25.